The city of Flint, Michigan has been poisoned by bad governance. That’s not a metaphor: it is literally true. Flint, located between two of the greatest freshwater lakes on the planet, is an old industrial town, ravaged like its big neighbour Detroit by post-industrial decline. Because of this collapse, State Governor Rick Snyder (campaign slogan: “one tough nerd”) sent in the suits to fix Flint’s books. In order to save $5m or so, they decided the city should stop buying water from Detroit and start processing water from the astonishingly polluted Flint River. On April 25, 2014, the city made the switch from fresh water from Lake Huron to “treated” effluent. By August, officials were advising people to boil their water because of an outbreak of ecoli; by October General Motors had stopped using the water to clean cars because it was so corrosive. By January 2015, Detroit offered to reconnect — for free — because Flint’s water was so bad. The suits in charge of Flint said no. Meanwhile, citizens were getting weird rashes, their hair was falling out, children were sick. And they were getting nowhere complaining to the local government. To cut a long story short, it turns out that the water that comes out of the taps in Flint, Michigan is toxic. For example, 104 parts per billion of lead were detected in drinking water: 15 parts per billion is considered unsafe. President Obama declared a state of emergency on January 16. Water is now being brought in by the army — in bottles. But for some children, this may be too late. 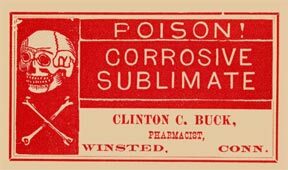 Lead poisoning can cause permanent brain damage and stunts growth. This is a tale of catastrophic failure in the world’s richest country, of course, and people should be going to jail. But it’s also a a story of American knowhow and assertiveness. If the citizens of Flint had not called in experts, the local doctor had not kicked up a fuss, if mothers had not nagged authorities and hassled officials, they might still be getting effluent out of their taps. It’s still possible to shame the people in charge into doing the right thing. The heroes of this story are the people of Flint who went on complaining — despite being dismissed as nuts by officials. Did the fact that the most vocal campaigners were mothers, or that most of the people affected are poor and black have any bearing on the criminally slow response? Now coincidentally — or not at all — I have just written a little bit about another story of water contamination in the ebook I completed on Friday. 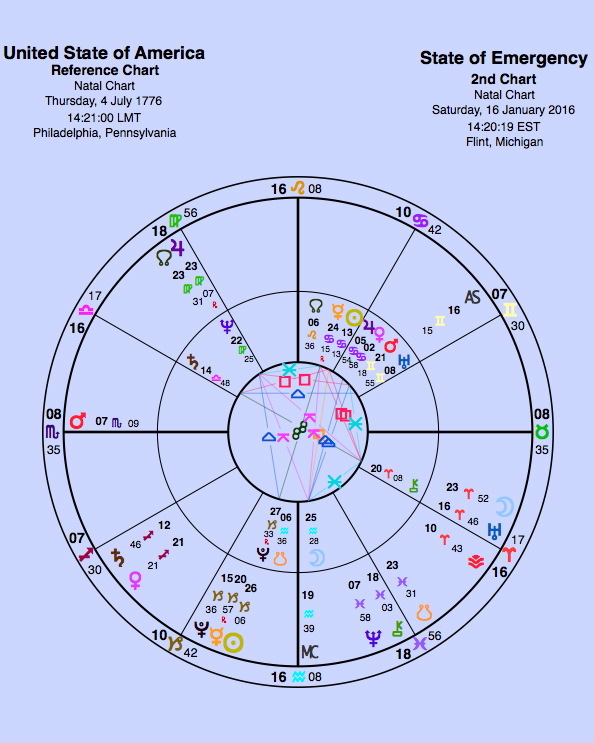 We are under a Neptune in Pisces-Saturn square again now. It’s not exact but the energy is there. This time Saturn is in Sagittarius (not Gemini), but we have the same idea of Saturn stopping Neptune (both water and disease). In Flint, even the government could not argue with the scientific data collected by, among others, Dr Mona Hanna-Attisha, a local practitioner who measured lead poisoning in children, and Professor Marc Edwards and his team at Virginia Tech, who got in their cars and drove to Flint to test the water. This is quite a chart! I cannot find the time when the button was pushed so this is set for mid-day. A Saturn-Neptune square can mean death by water, but the square may also offers solutions. Saturn is the planet we associate with measurement and science. The poisoning of Flint is significant for the whole of the United States. You can see this by looking at the charts. On April 24, 2014, the day Flint made the big switch, a Grand Cross — about the toughest pattern imaginable — was sitting on the US Sun. Jupiter, the planet of exaggeration, was on the Sun, with Pluto, the planet of destruction opposing. Mars Rx squared from Libra and Uranus from Aries. This activated the natal US Saturn-Sun square — native stinginess with a dam-busting combination. This Grand Cross was always going to have impact. It’s slow-working but we begin to see the cascading effect now. It would be interesting to recall what else took place under this aspect. 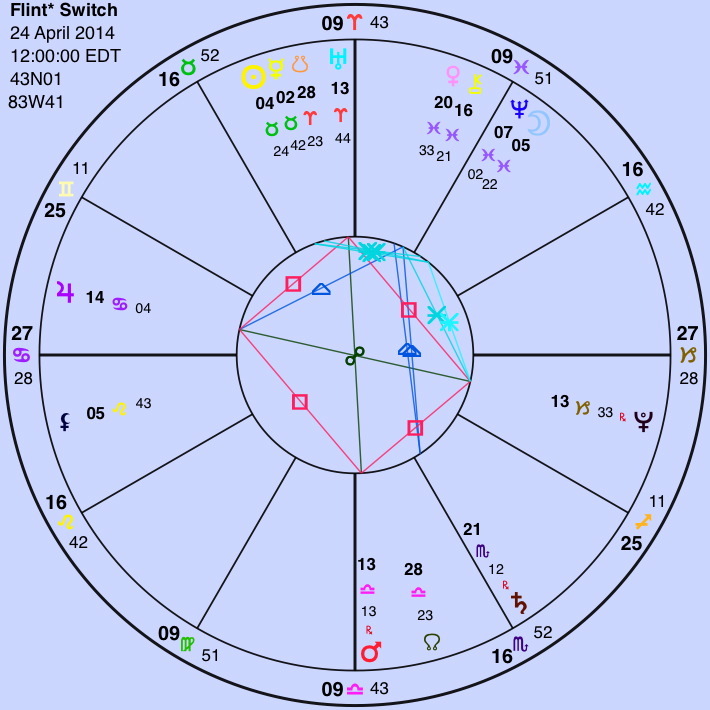 I’ve used the US Scorpio Rising chart here, which puts Mars right on the ascendant — a planet that signifies action. There are plenty of arguments about which US chart is right. I have not investigated enough to make my mind up but my colleague Michael Wolfstar makes a good case for Scorpio rather than the usual Sag. Either way, in the article the angles are not discussed. On the day President Obama declared a state of emergency, January 16, 2016, the Jupiter-North Node conjunction was on the US Neptune. This conjunction has been active for a while and will carry on for a month or so. Neptune rules water, of course, and in the US chart it’s in Virgo, which may be the planet’s detriment, but it may also suggest a land that is rich in water resources. However, water is already an issue in parts of America. California is having an awful drought — and the governor declared a state of emergency this January too. Jupiter and the North Node put focus on the future of America’s water resources. Saturn has reached 12° Sagittarius — the degree area of the Grand Cross, but one sign along. This puts the taskmaster and maker of boundaries in a quincunx with the US Sun. Science is going to change things. It might be an idea for everyone to test their water. But this story is an iteration of the bigger story of the past few years: inequality, and the fight against it. It’s as if one part of that tale has been put under a microscope and then blown up — just to clarify things. If government no longer protects its citizens this is what happens. In the States both Occupy and #blacklivesmatter have been attempts to stand up to the power elite, currently symbolised by Pluto in Capricorn. This was the theme of the Uranus-Pluto square. We saw in the Middle East what happens when Pluto wins. But if Uranus wins, we could end up with, say, super-Uranian Donald Trump as Prezbo. The two energies need to be integrated. Neptune in Pisces adds another level of complexity, of course…. but more on that later. I am thinking this square between Saturn and Neptune is also affecting Brasil and other South-American countries through the zika-virus. Disease brought along by contaminated water (in this case by mosquitos). Yes. If you click the link below for spiritualism, plague etc there’s also a bit more on the cholera epidemic in Russia in the 1850s — also waterborne. Astrology is SO amazing; correlates exactly with the circumstance of Flint! Thanks for the astro-insight, Christina. Interesting that Saturn is the planetary ruler of lead…Neptune ruler of water. Fracking for oil is a major industry here in the USA (what could possibly go wrong?) and there have been many complaints about underground water reserves being despoiled, not to mention the huge increase of earthquakes in those fracking areas, but historically not prone to such. There are now more earthquakes in Oklahoma than anywhere in the world and fracking is a major industry there. Oklahoma and the surrounding states all practice fracking, and they sit on one of the greatest natural underground water reservoirs, the Ogallala aquifer. Really interesting. I’ve always wondered about the Bronte sisters (and family) in Yorkshire who died young and I thought that was largely due to a polluted water supply. I live about just outside Detroit, and I have been following this case closely. It is crazy to see it on here! I follow your blog pretty religiously, but never comment. You are so insightful!! I especially love when you do personality profiles! But back to my original reason for commenting. It has come out recently that the Emergency Manager got a cheaper deal originally from Detroit, yet still chose to change the systems. Some are claiming the motivation for this was privatization (which would go along with the many awful things Snyder has implemented). Citizens are also speaking out saying they are still being charge, even to the point where their kids may be taken away if they don’t pay. Between this and Donald Trump, I’m very scared for where my country is headed. Michigan is being managed not governed at this time Craven Plutocrats disenfranchised thousands of voters and installed puppet Emergency Manager régimes in cities with majority African American voters. Local school boards, city councils, mayors have been castrated by these draconian measures. Mass Flint water poisoning is the result. State of Michigan employees in Flint were given an alternative water supply in their state run office buildings in January of 2015 and that continues to this day. Belying claims that the governor knew only in Oct 2015. This Libra-Scorp stellium is praying for justice and transparency. Oh my word, Kelly — look at those planets in Pisces! That is a Neptune Return…! And Neptune is exactly squaring Saturn too (lead). Thank you for the lead connection. Did not put that together! It just gets more interesting/ lamentable as anti-green companies lurk to profit from the crisis. Nestlé corp has personal ties to the governor- and the publicity spin doctors he hired. This health and political crisis highlights seceral EPA failings and water-chemical and or lead issues across the U.S.
Situation only addressed to spare reputations and avoid criminal charges. Christina, Dr. Marc Edwards started http://www.flintwater.org for Flint citizens and those following this ever evolving story. Lots of low Neptune glamour, lies, eel like avoidance of responsibility! !